Another book that passed briefly through my hands recently was Miranda Gore Browne’s Bake Me a Cake as Fast as You Can. It has lots of easy to bake cakes which all sound quite delicious, but the one that caught my eye was Brighton Cake. It’s a very old fashioned and simple cake where you rub the butter into the flour rather than creaming it. A bit of nostalgia crept in when I saw it and a burning need to use up some very old jars of jam. For Christmas I was given this beautiful cake cutting set by a friend – a knife and slice. It’s fair-trade and the handles are made out of recycled bone. A friend was coming around for tea and the occasion was going to be their debut. I did my usual tweaking and adapting – I had to get chocolate in there somehow. I upped the quantities to try and make an 8″ (20 cm) cake and added white chocolate to the mix. Weighed out 200g flour (half wholemeal, half white) and placed into a large bowl with 1 tsp baking powder, 85g caster sugar and ½ tsp maca powder (just so I feel I’m getting something healthy from the cake). Rubbed in 85g cold unsalted butter with my fingers until the mixture resembled breadcrumbs. Stirred in 30g white chocolate powder (I used Mortimer’s, but grated white chocolate would be fine). Used a fork to mix in two small eggs and a scant tsp of almond extract. Stirred until the mixture formed a rough ball of very sticky dough. Using the fork, pressed half of the mixture into an 8″ round cake mould. Spread the contents of a small jar of fig and pomegranate jam over the batter. Placed small blobs of the remaining dough over the jam and evened out as best I could with the aforementioned fork. Placed 16 blanched almonds around the edge of the cake, pressing down slightly. Baked at 180℃ for 30 mins when the cake was well risen and firm. Sprinkled with a scant teaspoon of caster sugar and allowed to cool for ten minutes. Turned out onto a wire rack to cool completely. I’ve fallen in love with this simple, but really quite delicious cake. It’s rather like a Bakewell tart with its almond bottom and crust and jam filling. I’m glad I was cautious with the almond extract though; the recipe stated two teaspoons for a smaller quantity of mix than I used. I expect the white chocolate helped to give a slightly richer feel. The texture was just how I like it, a little crunchy on the outside and soft and melting on the inside. As the mix was quite stiff, more like dough than batter, I was pleased to see the jam stayed nicely in the middle and didn’t sink. I am going to make another one this weekend for my mother – I’m thinking lemons. I’ve just made a similar cake with apples and dried apricots in the middle. As I made it, I thought jam in the middle would be tasty! Fig and pomegranate jam sounds delicious! The beauty of this sort of cake, is that you can fill it with pretty much anything that grabs your fancy. Apple and apricot sounds good. I’m going to try it with lemon marmalade and flavour the cake with lemon zest rather than almonds. Firstly I love your new cake slicers – those handles are beautiful even if the word recycled bone weird’s me out a little! Haha yes indeed Anne, I’m not quite sure what’s meant by that, but they are ethical and made by good people so I’m sure no-one was harmed in the making! Do try wholemeal flour, it gives a certain nutty quality to cakes and certainly makes me feel as though I’m being a bit less naughty. ooh this sounds delicious! I love Bakewell tarts, so this would be perfect for me! Thanks Sonia. It’s a bit easier to make than a bake well tart as you don’t have to faff around with pastry. This is fabulous Choclette! I love anything made with almonds and I adore figs. Very nice indeed! Thanks Alida, now you come to mention it, the flavours are very Mediterranean. It looks sensational. I too love this kind of almondy puddingy cakey thing. Recipe looks so interesting too with the White choc powder. Must try this. Do try it Dom, I think you’ll like it. Thanks Laura – isn’t it wonderful? Mortimer’s do excellent chocolate powder GG – good quality chocolate which is ground fine, for hot chocolates or baking. 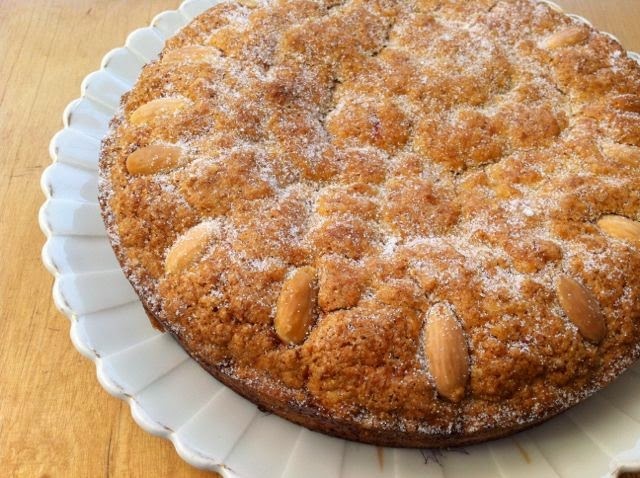 Your almond cake looks absolutely beautiful! Love that gorgeous golden crusty surface. I’ve got that book too, but only browsed through it so far. That cake looks gorgeous, but it needs some pouring cream in my mind. We might have had a slice with clotted cream Jac 😉 The book I borrowed from the library. You a Brighton girl CC? I only went there as a young child and my memories are vague. Thanks Ros. I like a good Bakewell, but this is a bit easier to make as there is no faffing around with pastry. I am a huge fan of almonds in cake so yum. We have similar tastes it seems Bintu. I love cakes like this….. almost scone-like…… Bet it would be amazing smothered in custard! Love the cake set too…. the handles are beautiful. What a lovely gift! Yes indeed, I was thrilled with the cake set Kate. And you are right, the cake is halfway between a scone and a cake. It’s very nice indeed and would be fantastic smothered in custard.